Before starting my career at Outline, I spent some time working as a private teacher. Those were hectic years when I struggled to get as much lessons as I could. Eventually, I ended up teaching like 5 different subjects with about 8 lessons per week. I have no idea how I managed to keep everything organised but now reviewing all the old paper notebooks and millions of print-outs I had, I think the app like Outline could have helped me a lot. After all, what teaching is about? From my perspective it’s about papers. I still keep all the notes I had, and it’s really a waste of space in my apartment: all the printouts for the students, my own literature synopses, and lesson plans. I know lecturers who can teach without plans but all of them have years of practice and only couple of courses that are all rather alike. When you teach English, Italian, Literature and some random liberal arts stuff, you cannot rely on your own memory, it’s impossible to keep everything in your head. It’s just too much information to remember. So the one good lesson I got for myself was to WRITE DOWN EVERYTHING! Every smallest question written on a piece of paper could serve as a clue to some lost but deadly important task. Those were the small pieces of papers I put into my paper notebooks, lots and lots of them. And then, the language courses: they need practice. Which means you need student books, work books, exercises, lots of examples, etc. Those are printouts for myself, and sometimes for the student too (another pack of papers). 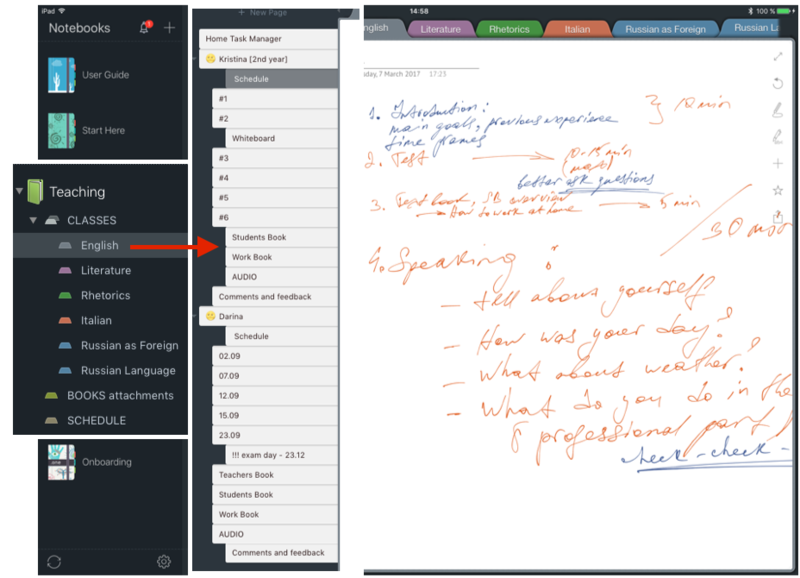 And so here is my idea on how to organize best different teaching materials using Outline. I’ve created a special notebook to keep all the teaching information in one place. It’s also possible to arrange everything into separate notebooks. However, as soon as I know that I have different themed notebooks too, I prefer not to multiply entities beyond necessity and keep all the courses under one cover. For different subjects / courses I’ve started separate sections placed in one section group. It looks more natural to me. It’s similar to sorting everything into separate folders when working with papers. (Oh, I had those, the biggest pain was when I had for example 3 different classes during the day and I needed to carry around 3 different huge folders). It’s also possible to keep the separate sections for each one of the students. However, I thought that as soon as a lot of materials can be shared between them, I would like to access them quickly being inside one section. First, I thought about keeping this notebook simple with only the courses specified sections on the first level. But then I realized that I would like to have with me a lot of additional dictionaries and work books – for those cases when the lesson is not over yet but you’ve already run out of the exercises. And I’ve put the courses’ sections into “CLASSES” section group and left only “BOOKS” and “SCHEDULE” sections outside. As I said, the “BOOKS” section is for various materials I would like to have with me. You can also store it in your cloud storage app, but when there is no time to think and choose, it’s always better to have the files organized and described. The “SCHEDULE” section can serve as general overview for the classes held and planned. 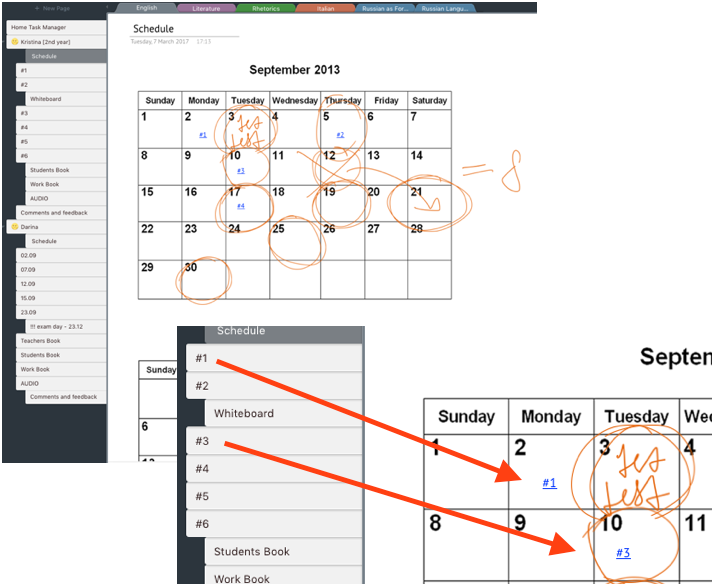 I would also keep the schedule pages for all of the students to track all the lessons – cancelled and rescheduled. It can be really useful when you calculate the month price based on the number of study hours. 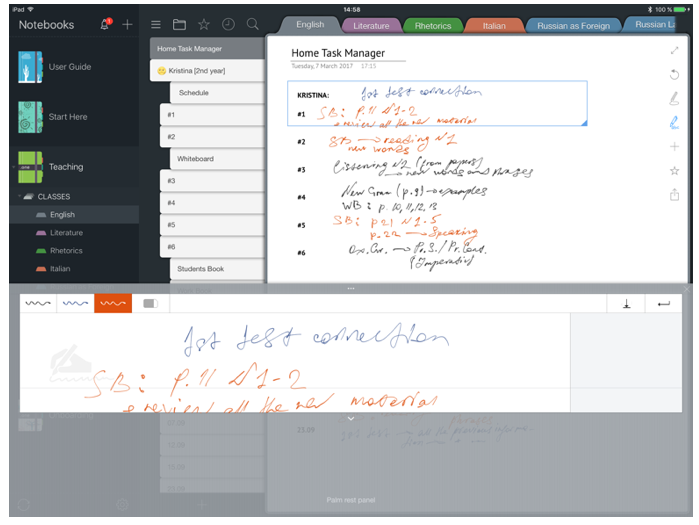 HOME TASK MANAGER: As a header I’d leave the overall home task overview, I don’t need any additional comments in there but I want everything to be recorded. STUDENT’S BLOCK: The next block is dedicated to one of the students. First page contains general information, like a telephone number, any other contacts, tests results, etc. Then goes the individual schedule to track the lessons and the material we work on with this particular student. I used the picture calendars I got from the Internet, but the same can be done with manually created tables. If the study plan for this day is already done, I can paste the link to this lesson’s page too. I prefer making them as it helps to keep the lesson organized, to check the progress and keep track of the topics already finished. It’s good to have a study plan to cover all the study period ahead, with goals and objectives pointed out, all of the language skills corresponding to a certain level listed. However, you can live without it too: good student’s book can be efficient enough. I usually used the PDFs rather than paper books, as it’s easier to carry around using tablet or laptop and you can simply print the pages you need to hand out to the students. On my old tablet I used several apps to keep open all the different PDFs at once. In Outline the PDF can be printed on a page and you’re free to copy and paste the pieces you need to move them to a particular page with this lesson’s plan. You can also annotate the PDFs without printing them: easy to keep everything in one app. This one can be used for various notes or comments you receive from the student. I usually communicated with the students through social nets. If there is something worth memorizing, this page can be used as a storage for all the requests and general questions. So in the end the notebook turned out to be rather heavy. However, my Dropbox managed to sync it. And once I’ve finished creating the pages and attaching the PDFs, I could open it on iPad. In case the overall size of the whole notebook is bigger than 5GB, maybe it is easier to divide it to several smaller ones. Mine is 2GB and Outline is totally fine with syncing it. It’s really up to you how you want to organize your work. As for me, I am thrilled to see how more effective I could have been if back then there was an app to help me with my teaching routine. This notebook is just a nostalgic demo, so if you like its structure, feel free to write to me at support@outline.ws, I will send the template by request. This entry was posted in OneNote on iPad, Outline in Education, Outline in real world and tagged Alena speaking, Teaching by Outline Team. Bookmark the permalink. While it’s interesting to read about your strategy, for me a much more important issue is not so much the collection of information as the ability to find it afterwards (often years afterwards). But you don’t discuss this in your post. It would be interesting to know more about your experience of Outline’s search function – how easy it is to find things (especially handwritten notes! ), whether there are weaknesses/difficulties, whether you use tagging strategies and so on. 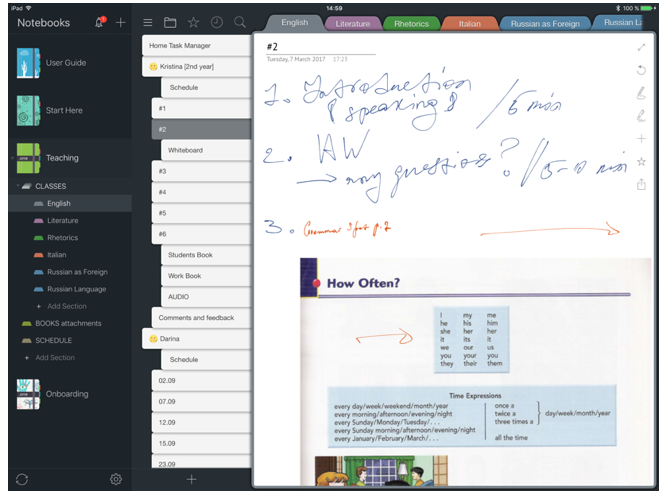 As part of that, it would be interesting to know how easy Outline makes it to collect together different bits of information held in various parts of a notebook – or even across multiple notebooks. 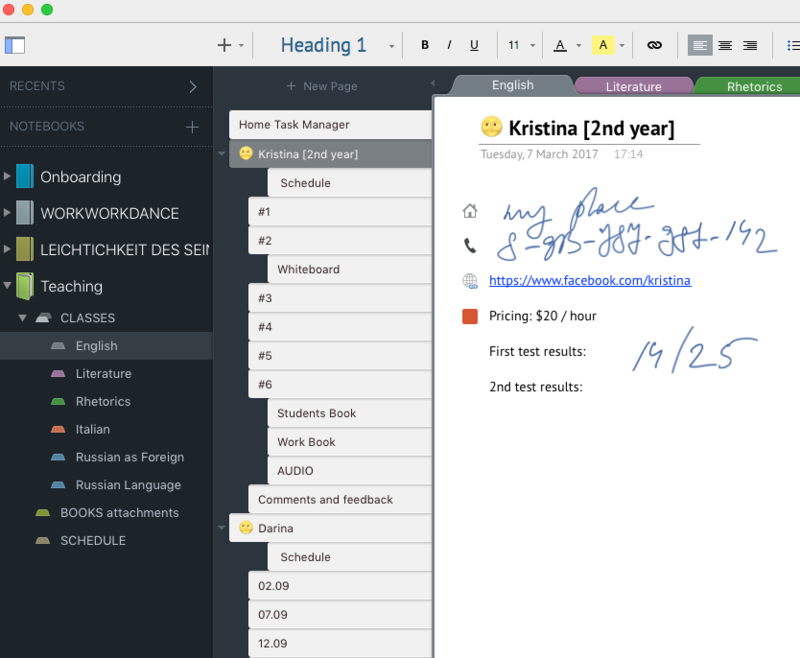 Let’s face it: Outline is an information manager. And managing information is about making it easily and immediately accessible. But this is by no means straightforward, and even well-known information managers don’t always do this very well. What’s your experience?